Mechanical Sheet Metal Shears | Cincinnati Precision Machinery, Inc.
Roper Whitney's 10M14 Mechanical Shear is the latest addition to the Roper Whitney line of shears. Manufactured in the United States, the 10M14 Mechanical Shear is of rugged construction, weighs in at 5,500 pounds, and this shear is powered by a 5 horsepower motor. The 10M14 produces up to 35 strokes per minute. Approximate Weight - 5500 lbs. 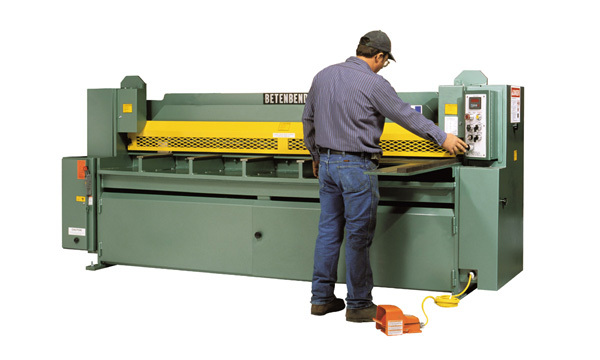 Betenbender designs simplicity and safety into its shears -- with an advanced hydraulic system and flexible operation. These mechanical shears are easy to operate, easy to maintain and able to withstand the rigors of today's production demands. A wide range of options for Betenbenders Shears are available. Push button and switch controls are at your fingertips. The fully guarded, 2-position 110V footswitch lets you interrupt the cutting stroke at any point in its cycle. A sturdy backgauge and rake angle adjustment minimizes twist and distortion, making it possible to increase the rake for cutting heavier stock and extend maximum capacity of the machine. A 4’ squaring arm with recessed scale makes for fast, easy measurement with your Betenbender Shear. Betenbender shears provide four separate edges for clean, burr-free cuts and long blade life. Easy blade gap adjustment means precise cuts for a wide variety of materials. Meets NFPA79 and construction requirements of the ANSI B11.4. 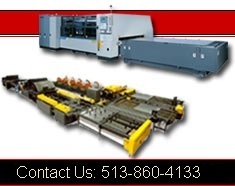 All machines have disconnect switches, magnetic starters, 110/120 volt controls, and 220/460 voltages. A Betenbender Shear is capable of shearing 1/8" (10 gauge) material to the following tolerance: Dimension - The width of the off-cut portion of the work- piece is within ±0.005 inch of the backgauge setting.